As you could see our family budget figures for the last 8 years are distinctly split into two periods: 2007-2011 and 2011-2016. The main reason is that we moved to a different area, where the cost of living is significantly higher in all possible respects. I need to convert my last year expenses into US dollars and that is why it appears that we spent less. Local currency exchange rate is falling to USD (year to year basis over 15%). - Adult clothing expense stayed down as well. - We moved out of the house and there were some additional expenses – paint, end of the term cleaning, etc. - There will be additional expense “commuting” – for me getting to and from work, as well as second insurance for a car. They are likely to be around ~$8K a year. I am overall expenses to go up by approximately $12K a year, mainly due to commuting and fact that new house will start sucking in money. There is no economy growth in Western Europe and governments will do its best to unleash inflation, so salaries would stay or increase in notional terms. Potentially it should help to pay off mortgage if we stay employed. 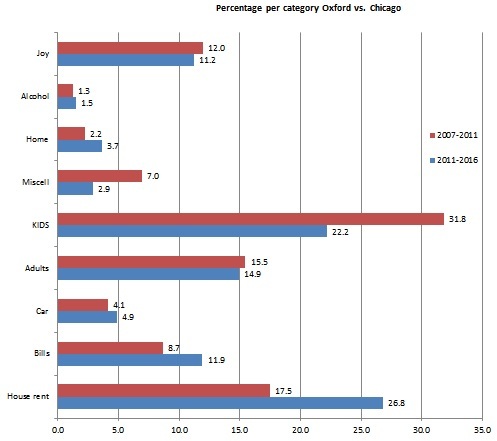 In local currency annual expenses should be around 66 K .
There is one distinct difference between Oxford and Chicago, as percentage of budget house rent and bills are significantly higher than in Chicago, while cost of the child care is significantly less. It is bad news if you decide to stay in Oxford for long, as eventually kids will go to school, while need for house and paying bills will stay. The price will go at least 30% higher if you decide to buy house. On in all I kept my last year goal to stay under $100,000 for our expenses event at last year exchange rate, when the dollar was much weaker. This may sounds insane but we were not paying for cars or mortgage last year.